The patroness of our parish, our Blessed Mother under the title “Our Lady of Mercy,” comes from the 1200s. Her title reminds us of the 1218 apparition asking for the ransom of Christians (mercede) who sell prisoners to Arabs (Saracens) occupying Southern Spain and Northern Africa. The title was promoted by the congregation of the Mercedarians: a feast in her honor was proclaimed in 1615 to commemorate the apparition. Until 1961 celebrated on September 24, it is no longer part of the Roman liturgical calendar, but we celebrate it here locally at OLM every year. The idea of ransom was amplified in the course of history and came to signify mercy in the generic sense of grace. The year 1853 was indeed a very special year. Pope Pius IX reigned as the two hundred and fifty-fourth Pontiff. Franklin Pierce began his first year in office as President of the United States. Philip Allen finished his final year as Governor of Rhode Island and was succeeded by Francis M. Dimond. The Most Rev. Bernard O’Reilly served as the second Bishop of Hartford whose territory included all of Connecticut and Rhode Island. It was in 1853 that Bishop O’Reilly appointed the newly ordained Rev. Patrick J. Lenihan as the founding Pastor of the Church of the Holy Name in East Greenwich, later to be re-named the Church of Our Lady of Mercy. Upon arriving in East Greenwich, Fr. 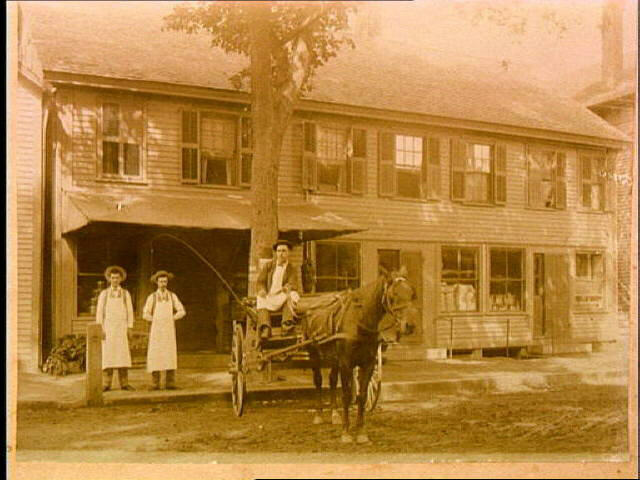 Lenihan stayed at Updike’s Hotel and then at the home of the Flanagan family, early Irish settlers in East Greenwich. On September 12, 1853, Fr. Lenihan purchased a house three lots at430 Main Street in the southern part of town where mostof the Irish immigrants lived. The house served as both rectory and the church of the Holy Name of Jesus. The parish boundaries extended from St. Michael’s in Providence to St. Michael’s in Pawcatuck, CT. A few years later Fr. Lenihan also purchased four lotson Sixth Avenue for use as a parish cemetery. In addition to East Greenwich, there were parish missions in Pascoag, Greenville, Wakefield, Wickford, Penix, Apponaug and Oakland Beach where Fr. Lenihan would offer Mass when possible. When Bishop O’Reilly relieved him of the responsibilities of the missions in Pascoag and Greenville, Fr. Lenihan was able to devote more time to his East Greenwich parish. Although Fr. Lenihan initially received some anti-Catholic threats, he soon became beloved not only by his parishioners, but also by most people in the town. He was known to be an eloquent preacher and a lover of poetry. While the prospects of his new parish had begun to improve, Fr. Lenihan’s health failed under the burden of his priestly work. Fr. Lenihan died on June 30, 1857 at the age of thirty-two and was buried in the cemetery which he had purchased a few years earlier. According to oral tradition, the cemetery was named St. Patrick’s in Fr. Patrick Lenihan’s honor. The Weekly Pendulum said of him that “his death willbe a great loss not only to his Church and countrymen, but to the community. He was a lover of good order, and was highly respected for his many virtues.” At the time of his death there were 100 members in the parish. For the next ten years (due to a shortage of Priests) the parish had no resident Pastor. The parish was attended by Pastors from Phenix: Fr. Michael Wallace (1857-1864) and his successor, Fr. John Couch (1864-1867). Fr. Couch was able to purchase land on Main Street for a proposed new church. In November 1867, Bishop McFarland, the new Bishop of Hartford, named the Rev. William Hart as the second resident pastor, but his term lasted only a year due to ill health. Fr. Thomas Kane succeeded Fr. Hart and remained in East Greenwich for the next four years. During Fr. Kane’s pastorate the name of the Church was changed to Our Lady of Mercy. Due to the growth of the parish, Fr. Kane’s first concern was to build a new church. Ground was broken for the church on August 1, 1869 and the cornerstone was laid on December 5th. Among other things, the cornerstone contained the names of Pope Pius IX, President Ulysses S. Grant, Governor Padelford, Fr. Kane, James Murphy the architect, a copy of the Rhode Island Pendulum for that date, and the names of all the parishioners who had donated ten dollars or more to the building fund. On July 31, 1870 the Church was dedicated. The wooden Gothic structure seated six hundred people comfortably and cost $16,000. The guest preacher for the dedication was the Rev. Lawrence Walsh of Hartford who chose as his sermon text the verse from St. Matthew’s Gospel: Thou art Peter and upon this rock I will build my Church! During Fr. Kane’s pastorate, the Catholic population had grown to almost four hundred people. On February 16, 1872, the Diocese of Providence was established and Bishop Thomas F. Hendricken was consecrated the first Bishop. Fr. Kane was transferred to St. Patrick,Valley Falls and Fr. William Halligan was named the new pastor in East Greenwich. During his pastorate, Fr. Halligan bought land and built chapels for some of Our Lady of Mercy’s mission churches. Those established were St. Catherine of Siena, Apponaug, St. Bernard, Wickford and St. Francis of Assisi,Wakefield. Recognizing the outstanding work ofFr. Halligan, inDecember 1879, Bishop Hendricken promoted him to the prestigious position as pastor of St. Mary’s Church in Pawtucket. The Rev. William Hines became the new pastor of Our Lady of Mercy. During his pastorate of eight years, the Catholic population in East Greenwich increased to just over a thousand souls. In January of 1888 Bishop Matthew Harkins, the second Bishop of Providence, appointed Fr. Owen F. Clarke as pastor of Our Lady of Mercy. Fr. Clarke built a new rectory next to the church, purchased more land for St. Patrick’s Cemetery. During this time the first Italian families began settling in East Greenwich. To better meet religious needs of the Italian Catholics in his parish, Fr. Clarke secured the services of Italian-speaking Priests to preach missions and offer occasional Masses. By the end of his pastorate in East Greenwich, there were over two hundred Italian Catholics in the parish. In June of 1899 Bishop Harkins appointed Fr. Thomas J. Fitzpatrick to succeed Fr. Clarke. As the Catholic population of Our Lady of Mercy and its mission chapels continued to grow, Bishop Harkins established St. Bernard in Wickford as a new parish in June of 1904. In December of that year, Fr. Fitzpatrick was transferred to St. Mary’s in Bristol and Fr. Peter Malone succeeded him in East Greenwich. Fr. Malone devoted a great deal of his time and energy to providing for the spiritual needs of the increasing number of summer visitors who vacationed at the Warwick shore resorts. In 1914 the mission church of St. Benedict in Conimicut became a parish, followed by St. Catherine of Siena in Apponaug in 1918. That same year, Fr. Malone was transferred to Holy Name in Providence and was succeeded by Fr. William R. Houghton. With the establishment of many new parishes in the area, Fr. Houghton took charge of a parish whose geographical size was greatly reduced. The parish boundaries extended from CowessettRoad in the north to Davisville in the south, but still extended for 23 miles to the state line in the west. In the early 1920’s, Fr. Houghton repaired and rededicated the church building. In June 1924. Bishop William Hickey, the third Bishop of Providence, transferred Fr. Houghton to Sacred Heart in East Providence, and appointed Fr. James P. Kelly as the new Pastor of Our Lady of Mercy. Fr. Kelly was much belovedbyhis parishionersandwasbestknownfor his generosity to the poor and his assistance to those who were in trouble. It came as a great shock to everyone when Fr. Kelly died suddenly two days before Christmas in 1926. On the day of his funeral, every business in East Greenwich closed out of respect during the time of his Funeral Mass. In January of 1927, Bishop Hickey appointed Fr. James J. Trainor to succeed Fr. Kelly. Fr. Trainor proved to be a first-rate administrator for the parish. After receiving a parishioner’s legacy of $7,000, Fr. Trainor rebuilt the sanctuary. The centerpiece of the new sanctuary was a marble altar from Pietrasanta, Italy, with a carved relief of the Last Supper. (The same altar is the main altar of sacrifice in our present Church.) Fr. Trainor also conducted a successful capital fund drive for the renovation of the Church pews and electric lighting fixtures, as well as continued improvements to St. Patrick Cemetery. Due to Fr. Trainor’s persistence and hard work, high school students in his parish were finally allowed to go to Catholic high schools at the town’s expense, instead of attending The East Greenwich Academy (a school owned and run by the Methodist-Episcopal Church). Fr. Trainor was also active in the civic affairs of the town and was a proud chaplain for the local fire company. As The Pendulum noted, “his counsel was frequently sought when matters of vital interest to the community were being considered.” Fr. Trainor died on March 28, 1943 after serving 16 years as pastor at Our Lady of Mercy. Bishop Francis P. Keough, the fourth Bishop of Providence, appointed Fr. Joseph A. Devanney to succeed Fr. Trainor. During the Second World War, the Naval Air Station was established at Quonset and the Seabee Base in Davisville. At the end of the war many Navy families settled permanently in the area greatly enhancing the size and the diversity of the parish. Recognizing this, Fr. Devanney made plans for a new church as well as a parish school. Before such plans came maturity, however, Fr. Devanney was transferred to Sacred Heart in East Providence in June 1947, and Fr. Francis P. Brady was appointed as the new pastor. Fr. Brady had a tremendous concern for the youth of the parish and the building of a school was his first priority. With the permission and encouragement of Bishop Russell J. McVinney, the fifth Bishop of Providence, Fr. Brady purchased the Hugh E. McGraw home on First Avenue for use as a convent and invited the Sisters of Mercy to staff the new school in the basement of the Church. In September of 1950, the first students enrolled at Our Lady of Mercy School. The Kindergarten class was in the Convent, and grades one and two in the basement of the Church. Under the direction of the first principal, Sr. Helena McNulty the number of students grew rapidly. In the summer of 1951, Fr. Brady then purchased three acres of land on Fourth Avenue and began construction of a new school building. 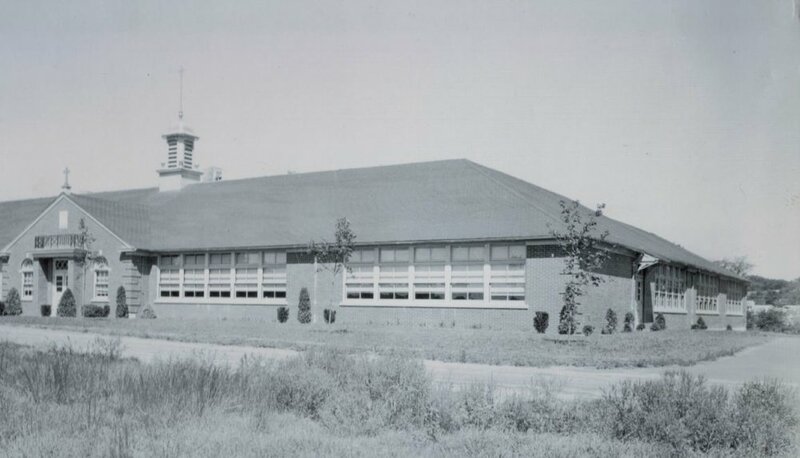 The new school opened in January of 1952. Additional grades were added each year until there were eight grades in all. The school population grew so rapidly that two new wings were added in 1955. As the parish population continued to grow, Bishop McVinney established the parish of St. Francis de Sales in North Kingstown in 1960. A year later, the parish of St. Gregory the Great was established in Cowesett. In spite of loss of parishioners to these newly established parishes, Fr. Brady realized that the old church on Main Street was in deteriorated condition and much too small. As a result a Building Fund Campaign was launched and ground was broken for a new church and rectory across from the school on Fourth Avenue. On September 16, 1965, Auxiliary Bishop Bernard M. Kelly dedicated the new church and rectory. After 23 years as pastor Fr. Brady realized that he did not have the health to deal with the continued demands of the growth of the parish. In the spring of 1970 Fr. Brady retired and celebrated his 50th Anniversary of Priesthood in the church he had built with the parishioners he had served so faithfully. Fr. Brady died on October 8, 1971. 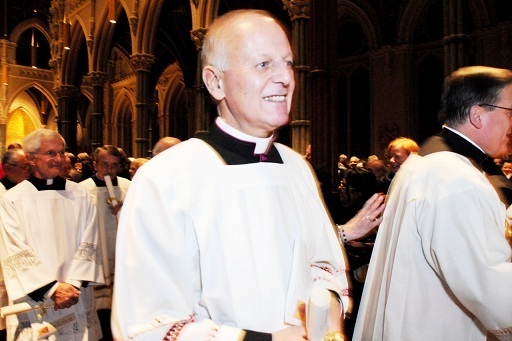 Bishop McVinney appointed Monsignor. Arthur A. Sullivan as Fr. Brady’s successor. As former Rector and professor for many years at the Seminary of Our Lady of Providence, Msgr. Sullivan was loved and held in the highest esteem by the parishioners of Our Lady of Mercy. Like Fr. Brady, Msgr. Sullivan demonstrated a tremendous loyalty and love for our school. This became even more evident after his death on January 30, 2000, when he left in his will the sum of $25,000 specifically for Our Lady of Mercy School. After Msgr. Sullivan’s retirement in 1986, Bishop Gelineau, the sixth Bishop of Providence, appointed Monsignor Richard D. Sheahan as his successor. During Msgr. Sheahan’s pastorate, the renovations to our sanctuary were completed. In addition our parish’s successful Outreach Program was established to care for the needy and underprivileged. Due to a decline in many of our Catholic schools in the 1980’s, Msgr. Sheahan eliminated the 7th and 8th grades, and in turn opened the New Discoveries pre-school program. In 1992 Bishop Gelineau appointed Msgr. Sheahan as the founding pastor of Holy Apostles parish in Cranston, and named Monsignor John W. Lolio as pastor of Our Lady of Mercy. During Msgr. Lolio’s pastorate a new Peragallo Pipe Organ containing 1776 pipes was installed in the choir loft and blessed by Bishop Robert E. Mulvee, the seventh Bishop of Providence. With the resurgence of the demand for Catholic education experienced throughout our Diocese, Msgr. Lolio re-opened the 7th and 8th grade and implemented the construction of a new wing to our school, which Bishop Mulvee blessed and dedicated in 2000. Around the same time the large parcel of property and white house east of the school was purchased. The land was converted into a large parking lot and the house renovated for offices for our Outreach Program and our Religious Education programs. Msgr. Lolio served as the 16th pastor of Our Lady of Mercy Parish until his unexpected passing in 2012. The solemn transferral of his body was celebrated May 10, 2012 by Bishop Robert C. Evans, Auxiliary Bishop of Providence, at Our Lady of Mercy Church. A Mass of Christian Burial for the repose of his soul was concelebrated May 11, 2012 at Our Lady of Mercy Church, with Bishop Thomas J. Tobin, Bishop of Providence, as the main celebrant and Bishops Robert C. Evans, Robert E. Mulvee, RetiredBishop of Providence, Louis E. Gelineau, Retired Bishop of Providence, Robert J. McManus, Bishop of the Diocese of Worcester, Mass., Salvatore R. Matano, then Bishop of the Diocese of Burlington, Vermont and now Bishop of Rochester, NY, Francis X. Roque, Retired Auxiliary Bishop of the U.S. Military Archdiocese, Ernest E. Boland, Retired Bishop of the Diocese of Multan, Pakistan and many priests concelebrating. Bishop Matano, Msgr. Lolio's life-long friend was the homilist. In June of 2012, following the passing of Msgr. Lolio, Bishop Thomas J. Tobin appointed Fr. Bernard A. Healey as pastor of Our Lady of Mercy Parish.